On the 11th hour of the 11th day of the 11th month, the guns finally fell silent across the Western Front. The Armistice of 1918 signalled the end of a conflict that changed the world and claimed the lives of nine million combatants, including 66,655 Canadians. 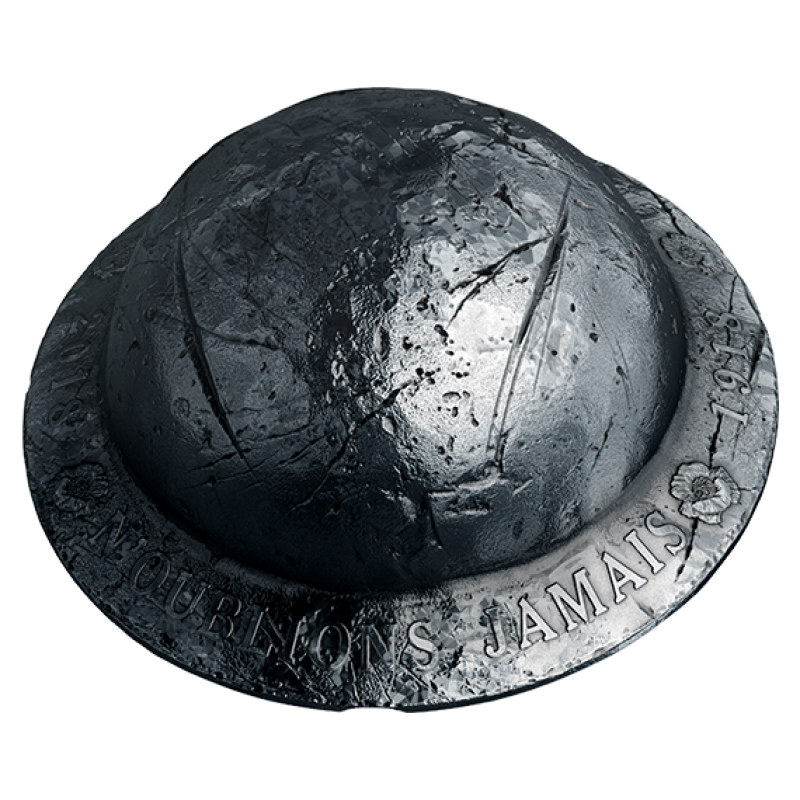 A century later, we honour the memory of all Canadians who served in the Great War with our most unusual shaped coin yet: a replica of a soldier’s Mark I steel helmet. 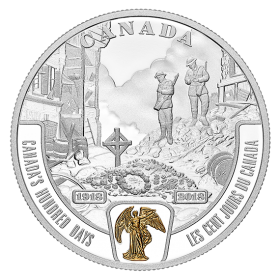 Your coin’s extreme curvature and antique finish leave a lasting impression, especially with added engraved touches that give the helmet a realistic, battle-worn appearance—Lest We Forget. 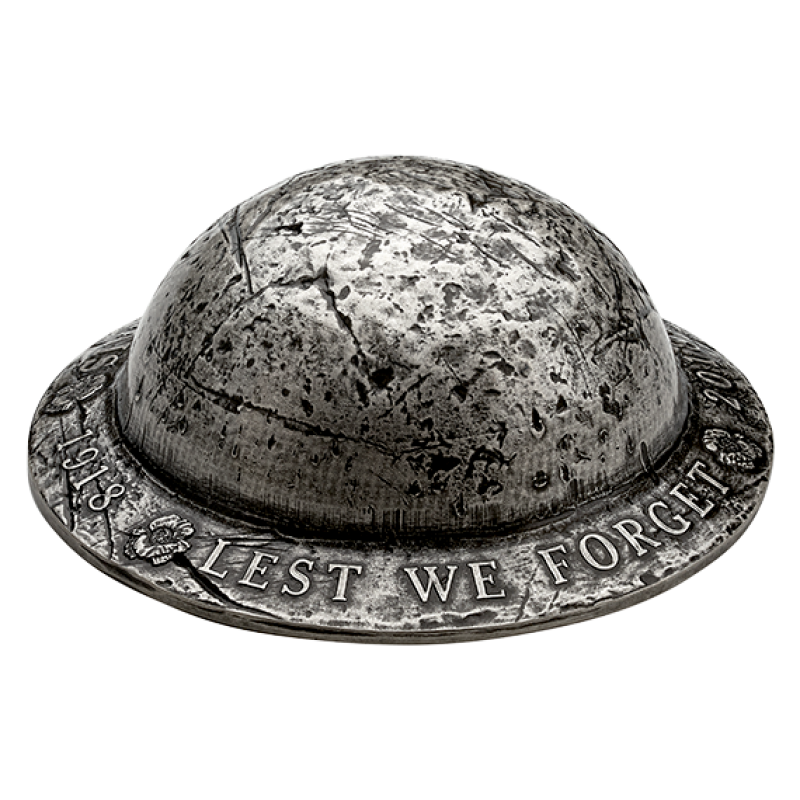 Add a realistic re-creation of a 1916 helmet-shaped coin to your war-themed collection. Order today. 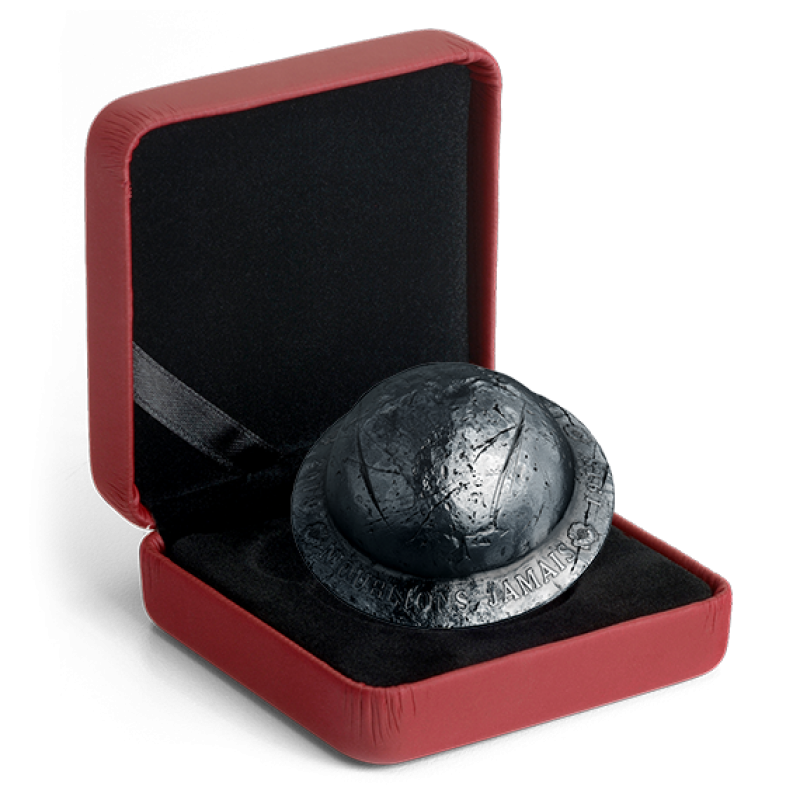 ONE OF OUR MOST UNFORGETTABLE FIRSTS: Your coin is our first extreme curvature coin is an exceptional feat of craftsmanship, with a more deeply curved surface than any other concave- or convex-shaped coin. 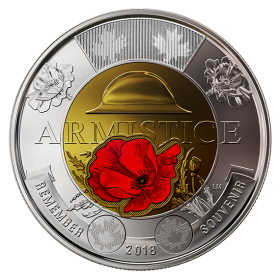 ONE HUNDRED YEARS LATER, CANADA HAS NOT FORGOTTEN: A century later, the Royal Canadian Mint commemorates the anniversary of the Armistice with its most unusual coin yet: a poignant symbol of remembrance shaped like the steel helmets worn by Canadian combatants in the First World War. 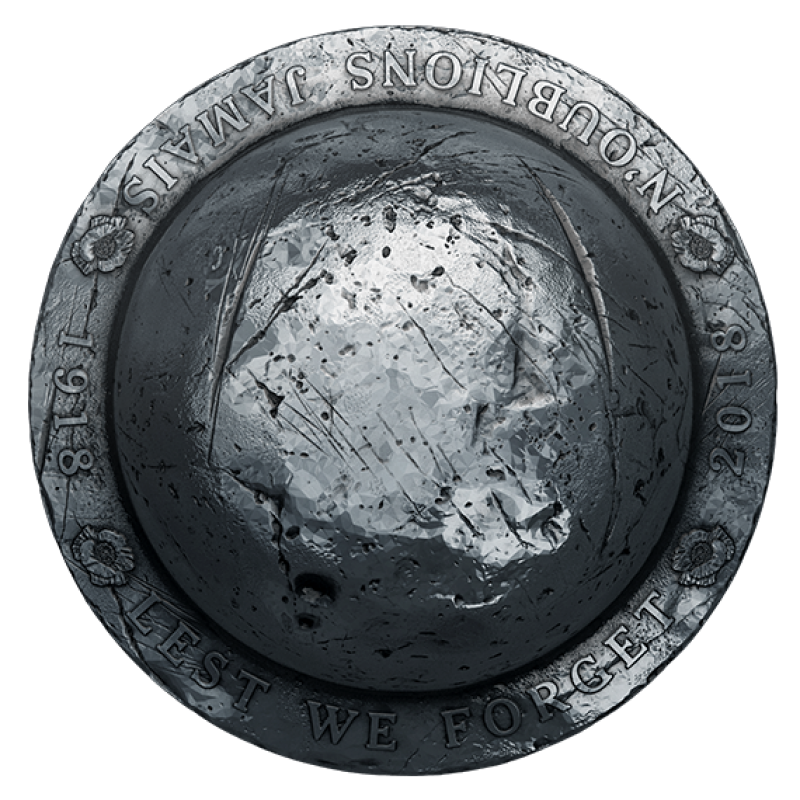 ANTIQUE FINISH: Your coin’s antique finish gives an appropriately aged and distressed look, while the engraved “cracks” and “markings” complete the helmet’s battle-worn appearance—a reminder of the reality of war and the hardships endured by those who fought and hoped for peace. 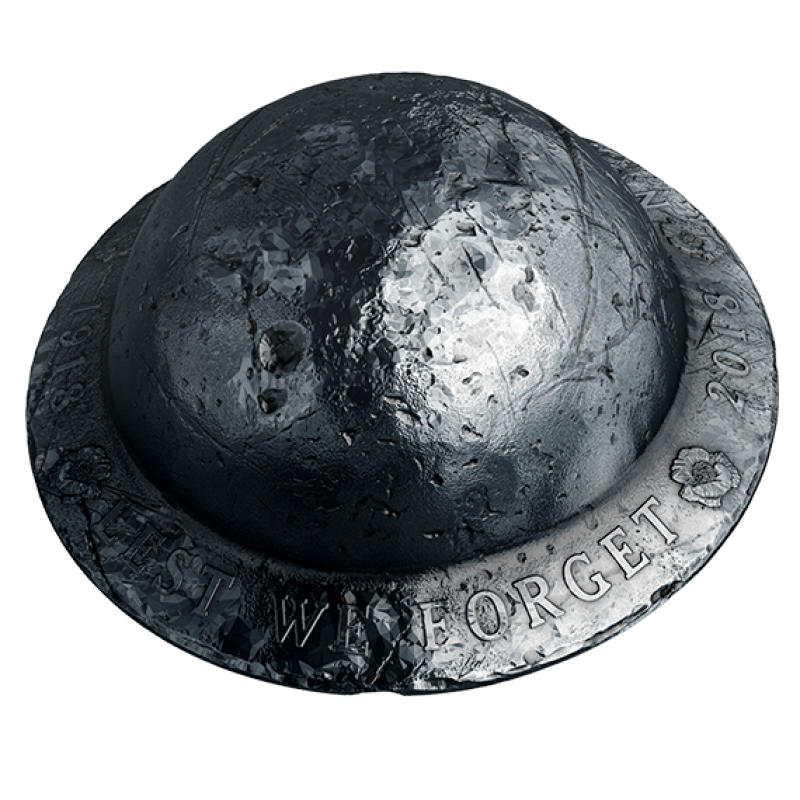 A POWERFUL TRIBUTE TO COURAGE AND SACRIFICE: The small-scale replica of the steel helmet worn by Canadian soldiers in the First World War is a heartfelt tribute to their legacy, echoed in the poppy-flanked words engraved along the brim: “LEST WE FORGET N’OUBLIONS JAMAIS”. 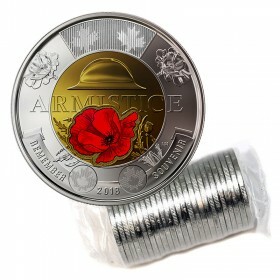 LIMITED MINTAGE: Only 6,500 coins will be made worldwide. 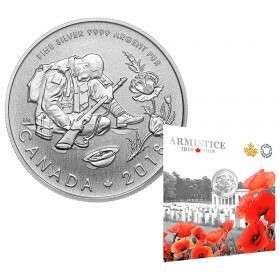 1.5 OUNCE 99.99% PURE SILVER COIN: Your coin is GST/HST exempt! 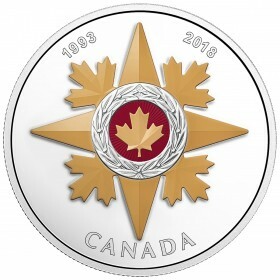 Resembling the 1916 Mark I model worn by Canadian combatants, your combat helmet-shaped coin is the result of a careful collaboration between Royal Canadian Mint engravers and engineers. 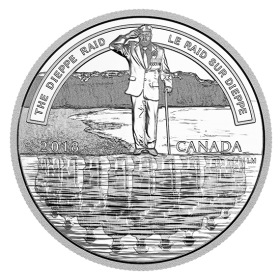 Your coin’s unprecedented, extreme curvature allows for a realistic re-creation (on a much smaller scale) of the bowl-shaped headgear issued to Canadian troops and all British Empire forces in 1916. 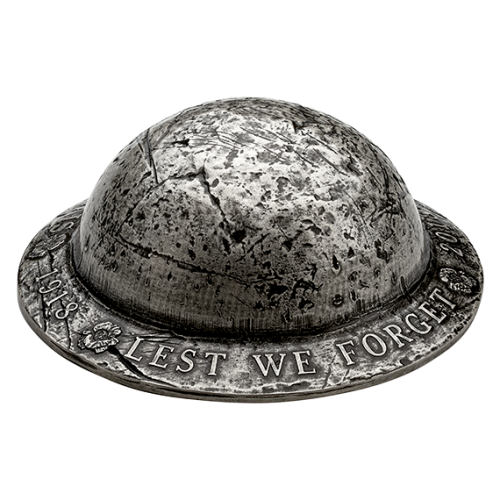 The reverse provides a view of the top of the now-iconic steel helmet, whose battle-worn appearance is the result of engraved “cracks” and “markings” beneath the antique finish that gives it all a distressed look. 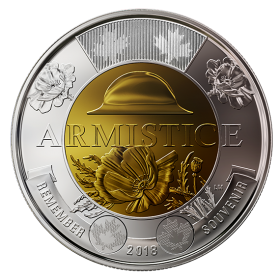 Along the brim that helped protect soldiers from airborne debris, the heartfelt assurance “LEST WE FORGET N’OUBLIONS JAMAIS” is flanked by engraved poppies, while the double dates “1918” and “2018” mark the centennial of Armistice. 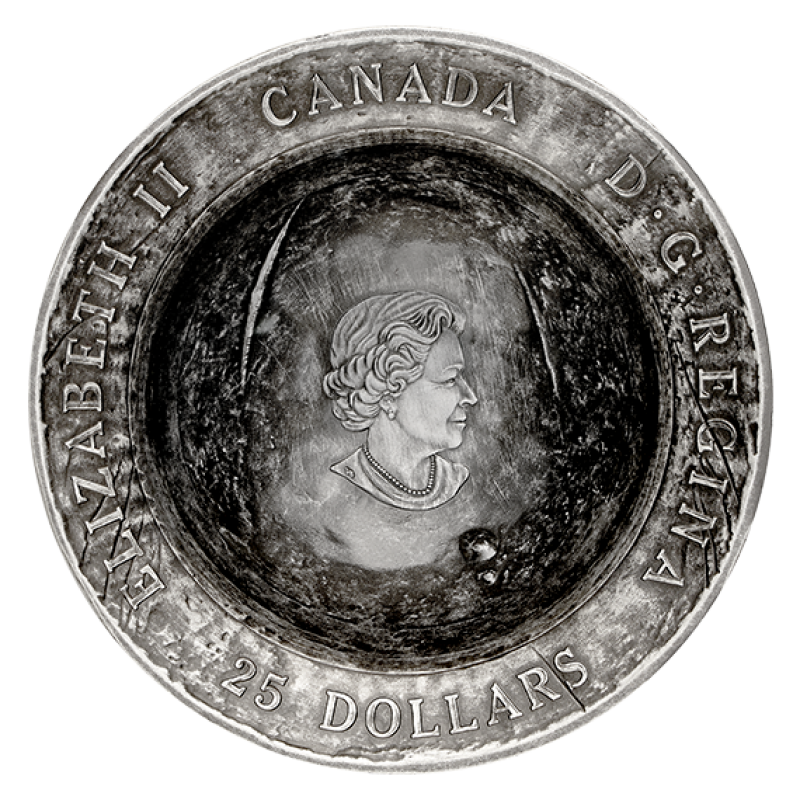 The obverse features the effigy of Her Majesty Queen Elizabeth II by Susanna Blunt engraved deep in the recessed circular crown, while the legend and face value are engraved on the brim. 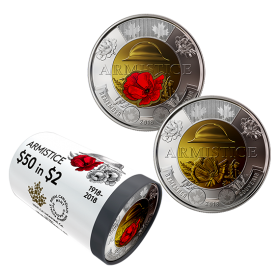 2018 (1918-) Canadian $25 Lest We Forget Helmet-shaped 1.5 oz Fine Silver Coin is encapsulated and presented in a Royal Canadian Mint-branded maroon clamshell with a black beauty box and Certificate of Authenticity.